Most surprising to me was (a) how consistent my cadence was when I repeated measurements at the same pace, and (b) how much it changed between paces: from 164 to 188, with every indication that it would decrease further at slower paces and increase further at faster paces. 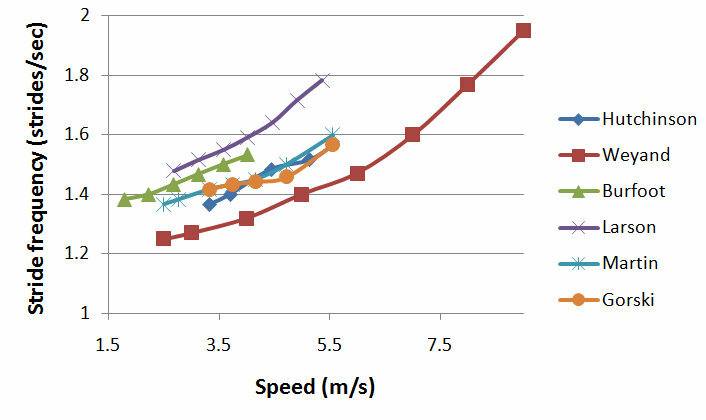 This certainly confirms what Max Donelan, the inventor of a “cruise control” device for runners that adjusts speed by changing your cadence, told me earlier this year: contrary to the myth that cadence stays relatively constant at different speeds, most runners control their speed through a combination of cadence and stride length. The graph is a little busy, but if you look closely, you’ll find that my data is slightly offset from the Weyand data, but has essentially identical slope. So compared to a representative example of Weyand’s subjects, I have a slightly quicker cadence and shorter stride at any given speed, but my stride changes in exactly the same way as I accelerate. So I’m not a freak: the fact that my cadence increased from 164 to 188 as I accerelated from 5:00/km to 3:00/km is exactly consistent with what Weyand observed. One key point: I’ve highlighted two key “speed zones.” One is the pace at which typical Olympic distance races from the 1,500 metres to the marathon are run at. This is where Jack Daniels made his famous observations that elite runners all seemed to run at 180 steps per minute (which corresponds to 1.5 strides per second on the left axis). The other zone is what I’ve called, tongue-in-cheek, the “jogging zone,” ranging from about 4:30 to 7:00 per kilometre. This latter zone is where most of us spend most of our time. So does it really make sense to take a bunch of measurements in the Olympic zone, and from that deduce the “optimal stride rate” for the jogging zone? This isn’t just a question of “Don’t try to do what the elites do.” If Daniels or anyone else had measured my cadence during a race, it would have been well above 180. But at jogging paces, it’s in the 160s. I strongly suspect the same is true for most elite runners: just because we can videotape them running at 180 steps per minute during the Boston Marathon doesn’t mean that they have the same cadence during their warm-up jog. In fact, that’s a pretty good challenge: can anyone find some decent video footage of Kenyan runners during one of their famously slow pre-race warm-up shuffles? I’d love to get some cadence data from that! That slope looks pretty consistent! Pardon if this is a very dumb question: I’ve always attributed the fact that I’m SHORTER than most humans (we have some LPs on the uni campus where I have my second job and I’m a few inches taller than them rather than a foot +) to the reason I have to make “so many” steps compared to the person jogging next to me. Surely, when I’m attempting to go faster, my stride increases as I’m “reaching out” in front and propelling myself farther/ harder off the back leg. Won’t I “always” have more strides frequency due to stride length being lesser (again, due to being stumpy)? And isn’t this the same for anybody less than average (perhaps quite a bit less than average)? Same type of results for me between paces of 7:10 and 13:00 per mile. I thought I was the only one like this after reading all the articles that you should strive for 180 regardless of pace. I’m 52 and ran 5Ks in low 15s in my early 20s. I wish I knew what my stride rate was back then. As far as a film clip, there’s Haile Gebrsellasie bio film “Endurance” – a few clips (very limited) of Kenyans warming up before the Atlanta 10000 final, plus extended footage of Haile training back home – a rather long series of side-view footage of him alone. I am able to keep my cadence at the 180 range regardless of speed… It is the intensity of the push off that makes the difference . Try it on a treadmill too and u can seer that cadence can stay high regardless of speed . Great post — I love seeing good work on cadence. This shows that if you consciously focus on increasing pace, you will accomplish this by naturally increasing both stride length and frequency. But my question is, what happens if your focus is on stride frequency, rather than pace? In other words, if you consciously focus on increasing stride frequency, how will this impact stride length and pace? Recently, I’ve been trying to increase my speed by training with a metronome, and although I have found that a faster cadence leads to a somewhat faster pace for me, the increase hasn’t been proportional, leading me to believe that my stride length is actually shortening slightly as I increase stride frequency. I haven’t taken the time to carefully measure any of this yet, though. This observation meshes with the standard advice given to overstriders, which is to increase cadence in order to shorten the stride length. Re-reading the “cruise control” post that you linked, I see that it quotes Max Donelan claiming that increasing stride frequency will also lead to increased stride length. I wonder whether I am mistaken about my own experience — I guess it’s time for me to hit the track and get some real measurements. Like Elise, my cadence is very steady and just a bit over 180. However, this seems to be the case only when I am NOT pushing off well. When I engage the entire leg in the running motion and therefore push off well, my cadence DOES vary. I did the engage-the-entire-leg experiment yesterday and in the process disabused myself of my long-held notion that my stride rate never varies. I am curious to see what my stride does at a full range of paces with proper push-off and will no doubt go back to counting steps next time I’m on the treadmill! I speculate that the author’s foot strike shifts forward with increased pace. I know mine does simply as a matter of economy. At quicker paces and faster cadence, it becomes more efficient to reduce ground contact time, so I necessarily shift to a nimbler forward strike. The main problem with general prescriptions about form is that it’s impossible to know how economical they are for an individual. Changes that come through training are necessarily tested for efficiency and recursively refined for your body and its idiosyncrasies. I submit that this is a more fruitful path to improved form for an individual than analysis of elites. I have kept track of ratio of cadence/stride length for about 6 months. Ave is 19.47 with St Dev of 1.37. With this ratio, faster paces have lower number for me. It might be interesting to plot that ratio with pace to see what it looks like. I have also tracked stride length/height. Ave is 0.68 with St Dev 0.06. Faster paces have a higher number. Amby – if you see this it is Ken S from your days in New London. I was at CGA from 77-81.
out of shape to go faster. :45 of each minute, and doubled the total to get my per-minute frequency. I am 6′ 0″ tall, and consider myself a short-striding shuffler. like to try it and post their results. You are not comparing yourself to “Weyand’s subjects” but to “a representative subject” (text under fig. 2 in his paper). I would rate “a representative subject” close to anecdotal evidence. Is a person that is able to run at a speed of 9 m/s “representative” and comparable to you? And is the procedure of suspending the runner in the air over a speeding treadmill and just recording 8 steps comparable to the running that you are doing? Didn’t you notice that Heiderscheit’s subjects were running by own choice with an average cadence of 172.6 steps per minute at an average speed of 2.9 m/s already before the manipulation and that increasing their step rate by 10 % brought it up to 190? If you follow your own suggestion at the end of this blog by increasing your cadence by 10 % your cadence of 164 at your slow speed will be exactly 180! Is your wife normally proofreading your articles? @Lily: “I’ve always attributed the fact that I’m SHORTER than most humans…” Absolutely. It seems totally obvious to me that body size makes a difference — and not just height, but also ratio of leg length to body length and so on. It’s ludicrous to think that at any given pace, someone who is 4’6″ should run with same stride length and cadence as someone who is 6’6″. @Ken and @Kent: thanks for the comments! @Elise: “I am able to keep my cadence at the 180 range regardless of speed…” Well, sure. So am I. But the question isn’t CAN I do it, it’s SHOULD I do it? (1) What happens to my cadence when I consciously increase my speed? (2) What happens to my speed when I consciously increase my cadence? In this post, I focused on the first question — I wanted to know what cadence I naturally settle into at different speeds. You’ve been experimenting with the second question: increasing your cadence, and then watching to see what happens to your speed (and consequently your stride length). What you’ve observed — that your stride length decreases — is exactly what people are hoping for when they recommend increasing cadence, since a shorter stride means you’re less likely to be overstriding. And that’s consistent with Bryan Heiderscheit’s work. You’re right that Max Donelan’s experiments apparently suggest the opposite. I suspect it has a lot to do with how the experiment is set up, and whether runners have the sense that they’re supposed to speed up as they increase cadence (as in Donelan’s cruise control experiments) or whether they know they’re supposed to maintain the same pace (as in Heiderscheit’s). We respond to the cues we’re given, to some degree. Interesting. It’s not immediately clear to me what that ratio tells us — I’ll have to think about it! @Jørn: Thanks for the comment, and for pointing out that Weyand’s data is from a single subject rather than an average — I’ve fixed the text. As for the rest of your comment: first of all, I’m not sure why you felt the need to be so rude. Second of all, I don’t think you understood the point of my post. I am perfectly aware that adding 10% to 164 gives 180. My goal wasn’t to teach basic arithmetic, it was to explore whether runners should expect to stay at a single cadence regardless of their speed. It’s pretty clear, even from your own comment, that the answer is no. Sadly, gravity is wreaking havoc with my stride rate. Secondly I think I understood your point perfectly – but I disagree with it and I also partly disagree with your comment to me (that the data shows that runners should not stay at 180 steps). For the record I am an old man – close to 65 – weighing 75 kg because of course build means something too. Back to the data from the “representative subject”: If you follow Heiderscheit’s recommendation and increase the subjects low speed cadence to 180 it appears that you can stay at this cadence until the Olympic Pace Zone. From there I admit that the cadence has to increase, because of anatomical limitations. I also increase my cadence at high speeds when running HIT where my speed gets above 6 m/s. So the best single advice you can give to “runners” (disregarding sprinters and Olympic athletes) is to bring their cadence (up) to 180 and stay there. Use a metronome or an mp3 cadence file to get there. It might take a couple of months to get comfortable at the cadence but give it a try. If it feels very difficult then try to go even higher and then drop back to 180. Why don’t you keep an open mind and try too? @Jørn: Thanks for the detailed response. The reason I thought (and still think) that you’re missing the point of my post is that both your comments have focused on proving to me that’s it possible to run at 180 steps per minute at a slow pace. This is a trivial point. Of course you can! I can too! The real question is: is there any reason that we SHOULD? The standard response I’ve been given when I ask that question is: Jack Daniels measured the cadence of Olympic distance runners during their races, and they all had cadences of at least 180, therefore this must be a good thing. The flaw in that logic is that it presupposes that Olympic runners racing with a cadence of 180 must also keep that cadence when they jog at a slow pace more comparable to how recreational runners run. In order to test in a limited way whether this is likely, I measured my own cadence at a variety of paces. Like the Olympic runners, my cadence was above 180 at Olympic race paces. However, at “jogging” paces, my cadence was significantly lower. 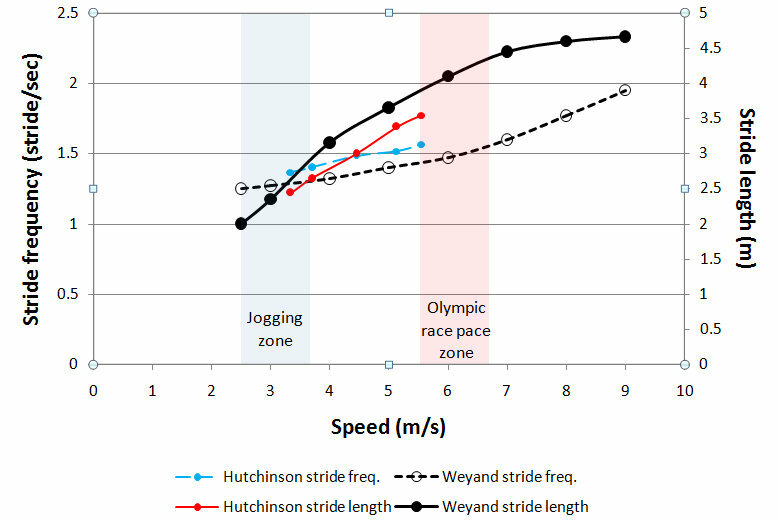 Therefore, I conclude that we shouldn’t draw conclusions about the “optimal” jogging cadence based on measurements of how Olympic runners run during races. To check that I wasn’t a complete outlier, I plotted my data atop that of the “representative” sample from Weyand’s paper. That was the point of my post. As for Heiderscheit’s paper, I agree with his recommendation that you should increase your cadence IF YOU’RE OVERSTRIDING. This could be true if you have a cadence of 150, 170, or even 190, depending on factors such as how long your legs are and how fast you’re running. But, like Heiderscheit, I see no evidence whatsoever to suggest that 180 has any privileged position as a “minimum threshold” to which we should all aspire. As with any running-related journalism, I hope the truly novice or recreational runners are cautious with this topic. This discussion focused on advanced, experienced runners. Alex, your suggest that ideal cadence can only come from experience and experimentation is the best take away for the new runner. For what it’s worth, I have introduced a few hundred to the joys of running and, without fail, cadence has been the number one key to transitioning them comfortably to running 5k. And the cadence I teach is 180. Thanks for the comment, Geordie — your points are very well taken. Like any persistent rule of thumb, part of the reason the 180 rule has stuck around is that it can be very effective for many people. As I mentioned in the post, I suspect overstriding is the most common error among new runners — and telling people to aim for a high cadence is a very straightforward and effective way of curing that problem (or avoiding it altogether). Keep up the great work! Heiderscheit’s recommandation is “that you should increase your cadence” (from the context it is: over your preferred cadence) – period – in his paper “Effects of Step Rate Manipulation on Joint Mechanics during Running”. The qualification about doing it if you’re overstriding is your recommendation. Overstriding is a poorly defined term, but from what I have seen it is most closely related to “excessive horizontal breaking force when the foot lands”. I have recorded many three axes accellerometer readings on runners but has never seen an absent horizontal breaking peak, but I can see that my average peak breaking force (measured close to my center of mass) was reduced by 40 % by going from 173 to 180. With your cadence at slow speed I would say that you are overstriding just from your cadence. I had all the reasons I needed to change from 173 to 180 – and I agree that 180 might not be my optimum number, but it is better than 173. (I do not know at what cadence I started, but it was probably close to yours according to my wife!). @David: I’m sincerely happy to hear that you’ve had success at 180. As I said to Geordie above, I have no doubt that aspiring to 180 can help many, many people. What I’m questioning is whether it makes sense as a universal prescription. If you were two feet taller and running half as fast as you do now, do you think the exact same cadence would be the right one? @Jørn: I’m happy to discuss and debate — that’s what the blog is for! I’ve spoken to Heiderscheit and discussed this issue in detail with him. I can assure you that he does not believe that there is anything special about 180 as a cadence. He believes that cadence is individual, depending on the body morphology and pace of any given runner. I find it hard to take seriously your argument that Heiderscheit’s paper is intended to apply to ALL runners, not just those who are overstriding. Do you seriously believe that, because of a study on some beginner runners in Wisconsin, Haile Gebrselassie should try to increase his cadence by 10%? Why would a runner who’s not overstriding want to increase his or her cadence?! (1) You believe my cadence is too low and should be increased. (2) Why should I increase my cadence? Because I’m overstriding. (3) How do you know I’m overstriding? Because my cadence is low. (4) So in conclusion, my cadence is too low because my cadence is too low. Q.E.D. Somehow, I’m just not convinced. Thus no qualifications with regard to types of runners and overstriding. It goes without saying that you cannot apply this increase to the same runner indefinitely. The 5-10 % is what he investigated and where he could see benefits that were not offset by metabolic cost or perceived level of exertion. (As he points out the slight increase in perceived level of exertion at +10 % may be due to increased attentional focus). The relationship between cadence and overstriding is trivial as shown in table 2 where the center of mass to heel distance at initial contact varies with a significant difference at each step from 11.4 cm to 7.0 cm when the cadence changes from -10 % to 10 %. Thus low cadence = overstriding. Instead of relying on your preferred cadence as something ingrained in you try to increase your cadence until the benefit of less loading is offset by increased metabolic cost or perceived level of exertion. My experiment along these lines showed that I could increase my cadence from 173 to 180 running at 8.3 km/h without any metabolic cost and with a DECREASE in the perceived level of exertion while among other things reducing my peak horizontal breaking force by 40 %. 2. The basis of this belief (for some but not all believers) is that Olympic-level runners are observed to run at a cadence of 180 or higher during their races. 3. My personal example shows that an elite distance runner who runs with a cadence of greater than 180 at Olympic race paces (e.g. 3:00/km) might also run with a significantly slower cadence at slower paces (e.g. 5:00/km). 4. The “representative” data from Weyand et al. shows that my cadence vs. pace curve is not unusual. 5. Therefore I conclude that the observation that Olympic distance runners race at 3:00/km with a cadence of 180 is insufficient evidence on which to recommend that joggers at 5:00/km should also aim for a cadence of 180. Of course there are many other aspects to the debate about cadence, such as braking force, footstrike, injury risk, running economy, and so on. These are all interesting questions, and none of them are addressed in this post. Perhaps 180 really is the magical cadence for all paces and all runners — but if so, observing Olympic distance runners racing at that cadence isn’t the evidence that shows it. What is the cadence here at 2:46 per km?! 4:12-4:32 is a good shot of him turning over at incredible speeds for an end of a half marathon. Have commenced a personal experiment to see if my cadence has changed from before I made some improvements (about 3 years ago) to my running technique and personal best times compared to afterwards. In some old video I found, at 5 min km pace 12kph I was striding at about 154 at 4 min km pace 15kph this had increased to 180. In the next week I will take some video and see if anything has changed and report back. I’m thinking now that I’m a bit stronger and faster that I might stride slightly slower at 4min km pace … we’ll see. Thanks for the informative read and lively discussion. Are you an elite distance runner? Otherwise I don’t understand your conclusion. I believe that its normal that cadence varies with speed but maybe the variation should be less for most people? If you use lower cadence it is likely that you either moves to much vertically or land with your foot in front of your body I would say, which both puts more stress on your body. Furthermore it seems too me that the Weyand study subjects are average runners and not elite runners so it just shows how the average runner increase and decrease their cadence according to speed. They should do a similar study with elite runners and compare the results because one assumes that an elite runner uses way better technique than the average runner. I didn’t intend to compliment myself — perhaps I should have said “well-trained” instead of “elite.” My best times are 3:42, 8:00 and 13:52. 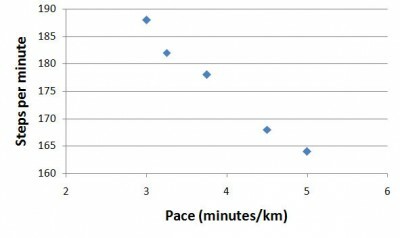 Of the other runners shown on my graph, Gorski is a 3:39 1500 runner, and Burfoot is a former Boston Marathon champion. I see no reason to assume that the change in cadence as a function of speed that we all display is somehow unique to “average” runners. I read JDaniels “Running Formula” around 12 years ago. I am a recreational runner, having run 1 yr in HS (400, 800), picked up Corporate Track in the mid 80’s which led me to weekend 5k’s, 10k’s, etc. As a result of reading Daniels I tested my stride rate at easy pace: it was consistantly 160-166 spm. Tucked away in the back of my mind it took me around five years before I mastered the 180 at easy pace, and can now go to 185 – 190 at will, at easy pace. It changed the way that I run. My stride is now, under and behind me, the push off and ankle extension being the source of the forward motion. I believe the change in form also helped to reduce arm swing and body rotation, by shortening the stride. At slow speeds on a tread mill, higher stride rates turn into more of a dance than a run; but the object is that as as stride rate increases, easy runs should become faster. Why would I wish to cut stride length to create an excessively slow pace? Daniels makes basically this argument: the less steps you take, the more time you spend in the air. Due to gravity, the only way you can spend more time in the air, is to launch higher, which of course leads to a more stressful impact on landing. That is Daniels justification for improving stride rate, – for those with lower than 180 strides per minute, at any pace. It worked for me. I understand his point. That is because you are running incorrectly. 5000/10000: ~180-190………the magic number! the one that jack daniels confused everyone about! I love this article. I have been trying to change my cadence to hit the magic 180 and have found myself stuck in the 160s and have strongly suspected that cadence (and possibly landing spot) are affected by speed rather than the other way around. Being an older, slower “runner”, I have no intention of running 5 minute miles ever again. So the question becomes, am I over-striding if I, at 5′ 9″, am around 164 strides per minute at my standard 10 minute mile pace? I agree with someone that said height should also be taken into account where shorter people will naturally have shorter strides. I now think just focusing on landing spot through minimalist shoes (or barefoot) is a better strategy to eliminating over-striding. Of course, this is from a whopping week of experimenting so far so I may think entirely differently a few months from now.